A word that is used rather frequently these days is “nationalist,” frequently when people refer to President Donald Trump. That term is generally used as a pejorative to accuse Trump of viewing America as the nation superior to all others, but more than that as the country that should dominate all others in every way imaginable. This point of view is the result either of people who don’t understand Trump, or those who deliberately attempt to gin up resentment and negative feelings toward the president. There are more than enough of both types of these folks to go around. Trump has even adopted the term for himself, but his use of it is that of “patriotism,” or having strong positive feelings about America, as well as a devotion to it. That is a position that every president needs and must have. Many of these folks who call Trump a nationalist are the polar opposite of that mistaken image of Trump; they are globalists. They are One World Government types, who believe and work toward a massive control mechanism everyone on Earth must obey. It would be like the United Nations on steroids. If your initial reaction to that idea is, “That’s not going to work. There are too many nations with different ideas of how things should be,” you have a point. Sure, some nations will willingly go along, like Germany and some of the others in the European Union, and some others elsewhere on the globe. The United States, however, has for its entire history done things its own way and been very successful doing that. 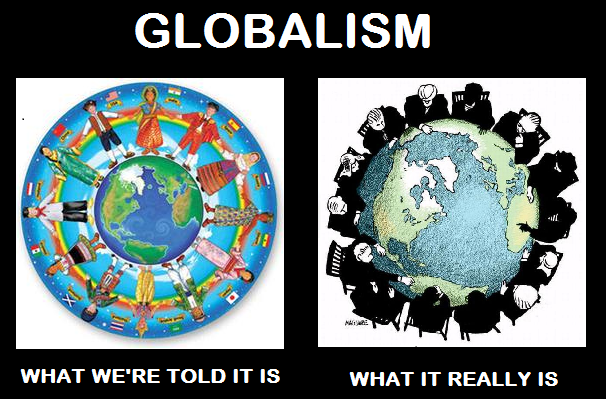 To most clear thinking Americans, globalism is not on their bucket list, though it may be at the bottom of a trash bucket. The only way the US will be a part of a world government is if we are forcibly made to conform or, more likely, subverted into subservience. Through such a process, strong social elements gradually are taken over and used to feed propaganda to the public. We see the news media and education systems now being transformed from their fundamental beneficial purposes to these socialist tools. The global warming/climate change mania is another area that is used to gently induce Americans to accept the concepts of global government through scare tactics of impending global doom. People believe this despite the highly blemished record of the climate change faction that includes outright fraud. Recently, another fallacy in this leftist demagoguery was discovered. A scientific paper published last month in the world’s premier scientific journal “Nature” suggested ocean temperatures have risen roughly 60 percent higher than estimated. That’s scary, and numerous mainstream-media outlets widely and uncritically reported this finding. However, mathematician Nic Lewis easily caught an error in this study: Despite the paper being automatically trusted and published in the journal, “a quick review of the first page of the paper was sufficient to raise doubts as to the accuracy of its results,” Lewis said. The authors have, acknowledged their “error.” Have you heard about this in the mainstream media? Americans were once a group of strong, independent, self-determining men and women. We find many now who are well down the pothole-infested road to surrendering to the socialist pap that grows so quickly, being well fertilized by feel-good leftist propaganda. Their susceptibility to such venom is in large part the result of failing critical social systems: the family, education, and the information media. The strong, nurturing nuclear family is in shambles, and our natural defenses, our protection against dopey ideas have been weakened through professional malfeasance in the other areas. Many teachers, especially in elite colleges and universities, apparently failed or skipped their Integrity 101 class, and now rather than helping students learn basic subject matter, believe it’s more important that they help them learn how to think “correctly” about things. Public education at the K-12 level helps in this effort. For some unexplained reason, there is less, or little, emphasis in teaching actual American history and classes in civics where students learn about their government, how it works and why it was established as it was. Consequently one or more generations of Americans are un-educated or mis-educated about the fundamental principles and mechanisms of their country, which are essential to understanding America, and appreciating it for all that it is. Is it any wonder that so many are able to be deceived and accept notions that are contrary to the country’s principles and best interest? These folks are prime targets for the platitudes of the leftist globalist puffery. Much of this degeneration began back in the 60s and got a boost during the catastrophic Obama administration, where America was routinely dishonored and criticized by the now former president. Re-educating the mis-educated generations is s daunting challenge, but it can’t be ignored.